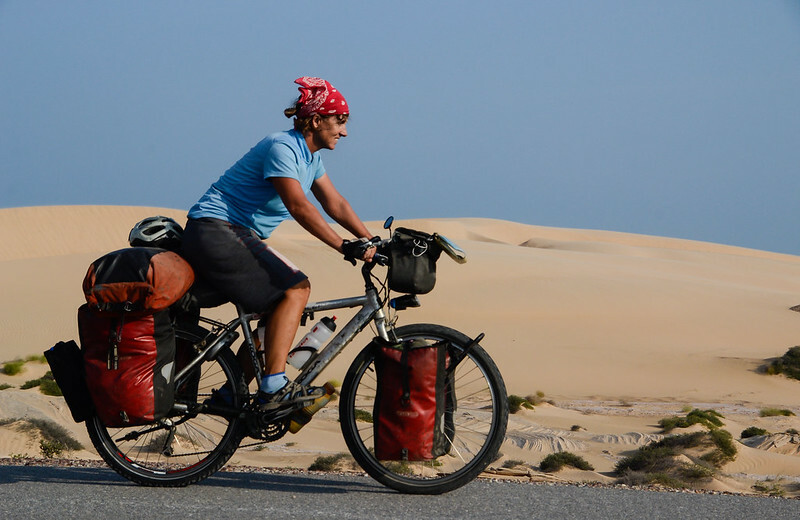 Bicycle touring in Oman? Yes, OMAN! That low key country just down the road from Dubai, snuggled up next to Saudi Arabia (where it’s actually illegal for women to ride bicycles) and Yemen (in the midst of a nasty civil war). Oman is an oasis of tranquility and stability in a region which is, well, troubled at times. 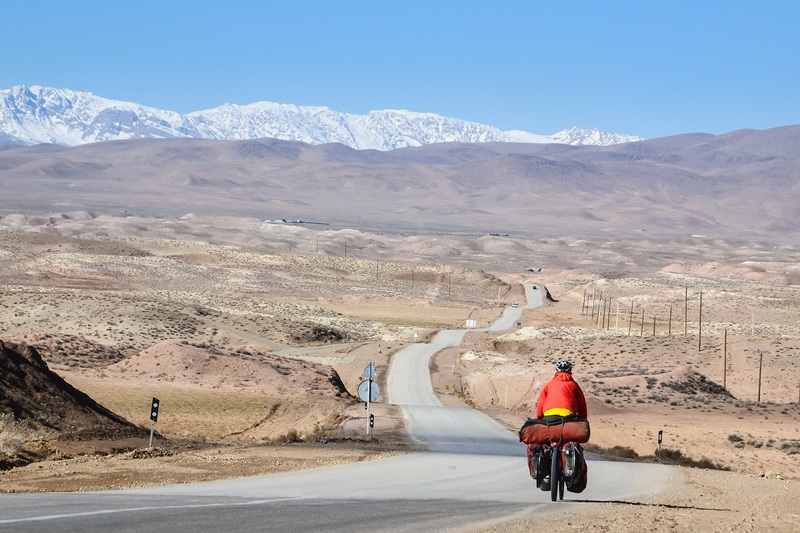 Of course just because there’s a spot in the Middle East where you can ride your bike without risking beheading by an ISIS operative doesn’t make it a great spot for touring. 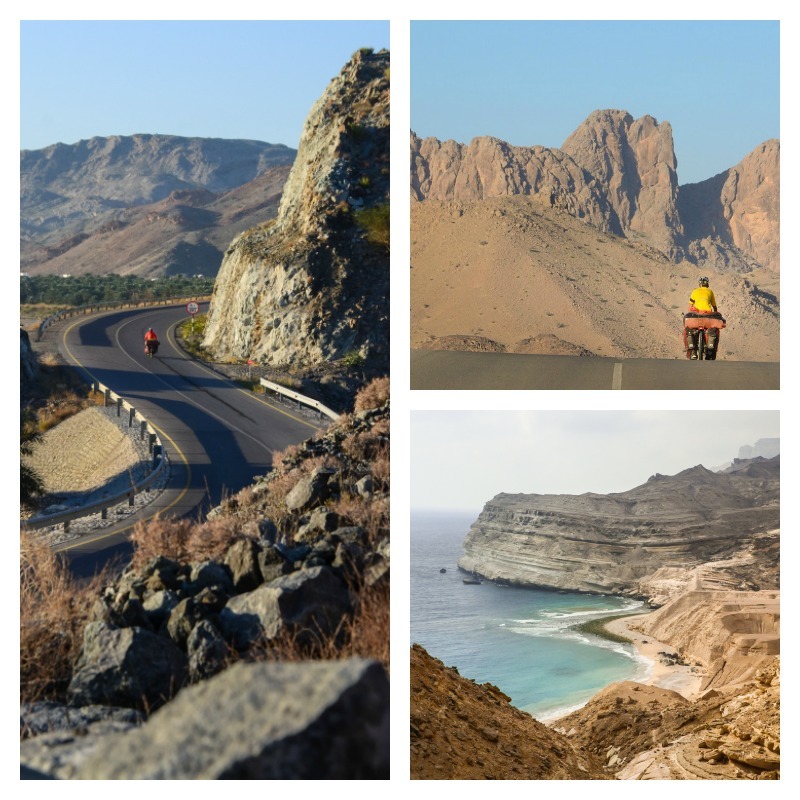 Craggy peaks and rugged terrain, empty deserts and a long picture-perfect coastline, ancient castles and forts–that’s what draws adventure cyclists to Oman. 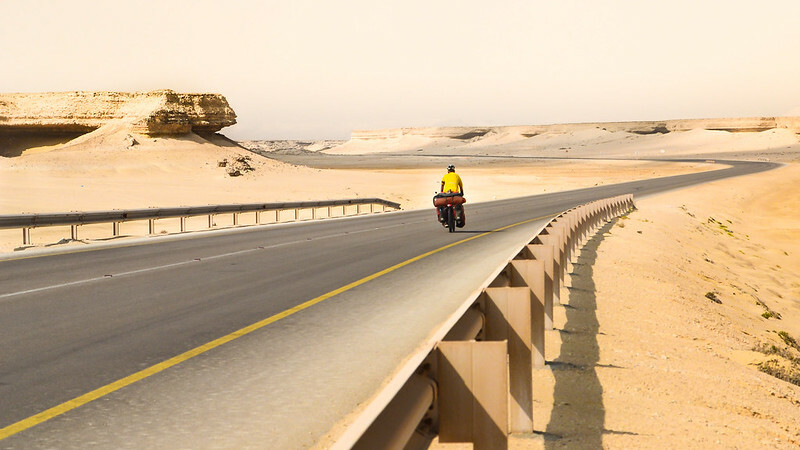 These days just a trickle of two-wheeled travelers makes it to Oman. But that’s sure to change. The government is making a big push to attract Western tourists. Better go now before the masses realize what they’ve been missing. We’ll answer a few FAQs to help jump start your tour. This is OMAN! WIld landscapes and wide open spaces. A true cyclists’ delight. 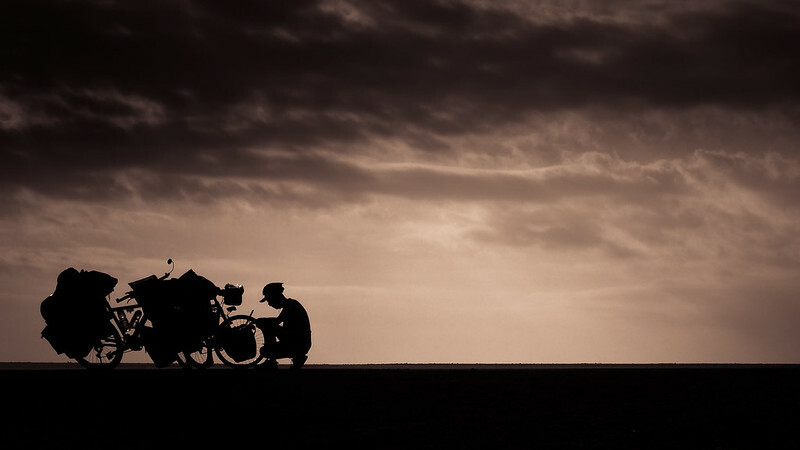 Is Oman safe for bicycle touring? Oman is, admittedly, not situated in the best neighborhood. 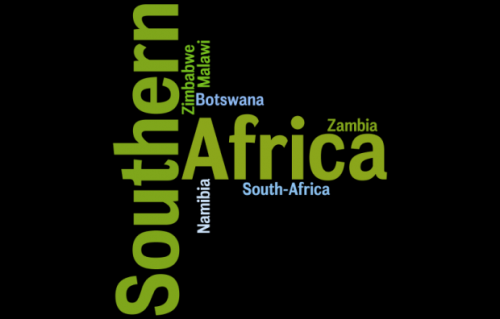 Paradoxically, it’s one of the world’s safest countries. As far as security is concerned, the Sultanate of Oman ranks right up there with super-safe Japan . Violent crime and petty theft are virtually nonexistent. Go ahead and leave your bike unlocked while you pop into the supermarket, it’ll be there when you come back. Pitch your tent on a popular beach and slip into a deep sleep, no need to worry about thugs waking you during the night. Parade through a crowded marked with your pricey camera, nobody will bat an eye. 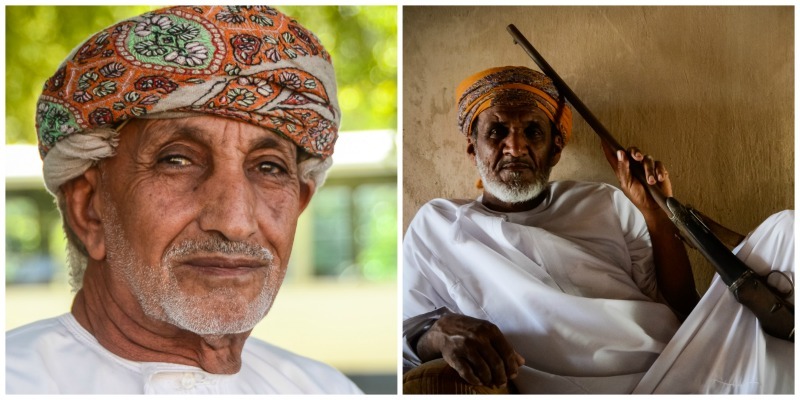 The Sultan is well-loved by his people and political unrest in Oman is about as likely as spotting a hipster sipping coffee in McDonalds. And don’t worry about standing out in a crowd. As in other wealthy Middle Eastern countries, foreigners make up a large part of the workforce. When’s the best time to visit Oman? In the winter (obviously). Unless you’ve got a masochistic desire to bake your body under the scorching Arabian sun, it’s best to cycle Oman between November and March. The rest of the year it’s unbearably hot and surprisingly humid. Enveloped by the desert on the road to Salalah. Lovely cycling in January, not so much in June. Will cycling in Oman cost me an arm and a leg? Absolutely not! Well, unless you want to check into a hotel every night. That’ll be expensive—count on at least $20 USD for a basic room, much more in major cities and resort areas. Wild camping is plentiful, safe and easy. So unless you really love your creature comforts, there’s no need to fork over your hard earned cash for lodging. Even the tiniest of towns will have a basic shop selling fruits, vegetables and basic goods at reasonable prices. Inexpensive restaurants run by expats from the subcontinent serve up cheap meals–$2 USD will get you lunch. Entry to forts and castles is free or very inexpensive. Oman doesn’t have a huge number of Couchsurfing and Warms Showers members, but we were able to find hosts on four occasions. We spent an average of $ 12 USD per day—almost exclusively on food. 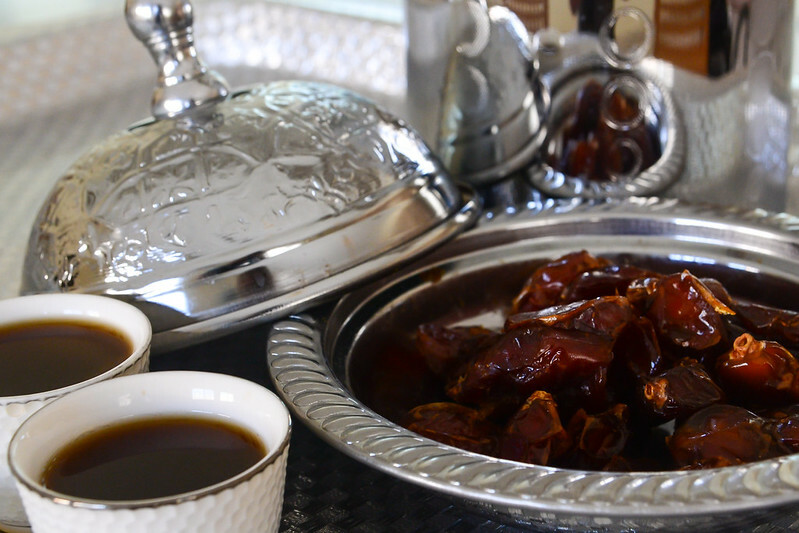 The ubiquitous coffee and dates. This is the standard way to welcome guests and a quick and delicious pick-me-up for touring cyclists. Are there any hassles in Oman? How’s local hospitality in Oman? Oman is fairly hassle-free. Locals don’t stop and stare and nobody will try to scam you. 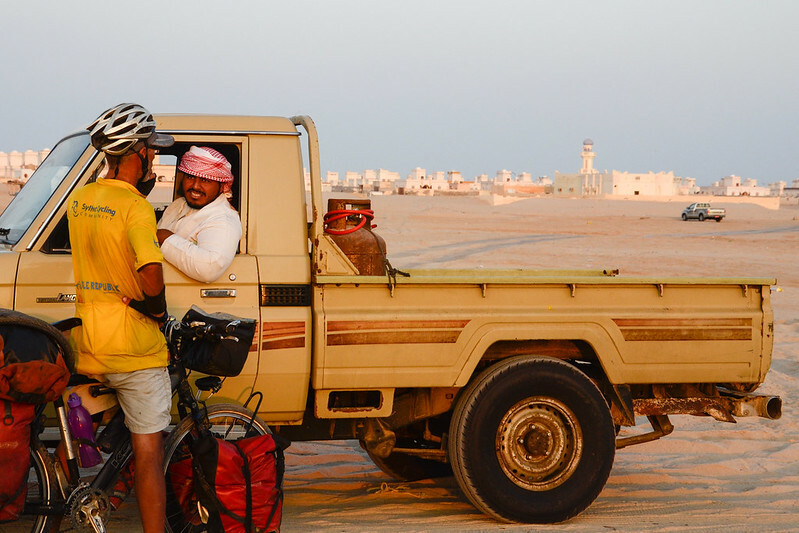 Omanis are very friendly and will often stop to ask if you ‘need anything.’ Some scruffy cyclists report being offered money. Gifts of cold water and snacks are common, and locals may invite you for a meal. Being invited home is rare-nothing like the non-stop invitations cyclists receive in neighboring Iran. Omanis are very private people and not as open to having random cyclists hanging out on their sofa. Do women cyclists in Oman need to follow a special dress code? Women in Oman are free to dress as they please. Women are not required to cover their hair and can even wear figure-hugging t-shirts, skimpy shorts and miniskirts if they feel like it. The recommended dress code in Oman is shoulders and knees covered. Shoulders covered, knees covered…I’m good to go. Highways and major roads are usually in good condition and generally have a wide shoulder. Roads without a wide shoulder are pretty scary. 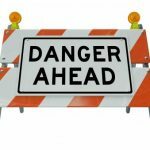 Mountain roads can be extremely rough and are often incredibly steep. 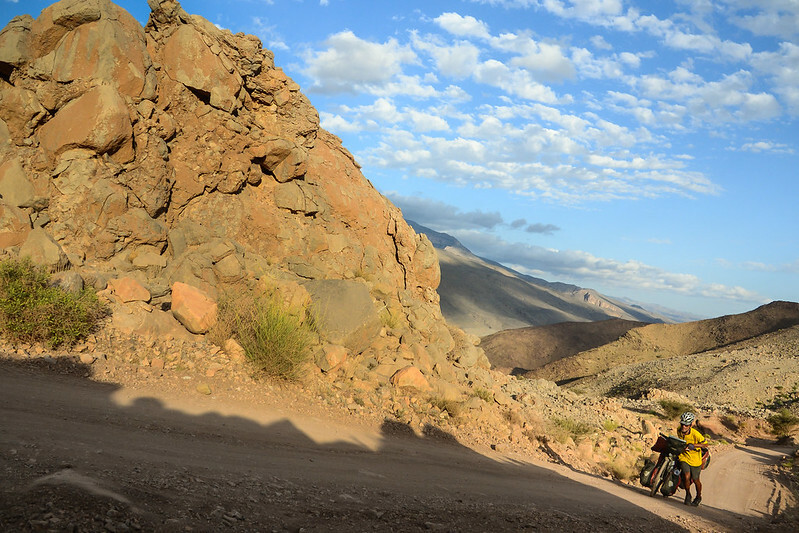 In fact, we have cycled no country with roads steeper than those found in Oman. Off road exploring in Oman. 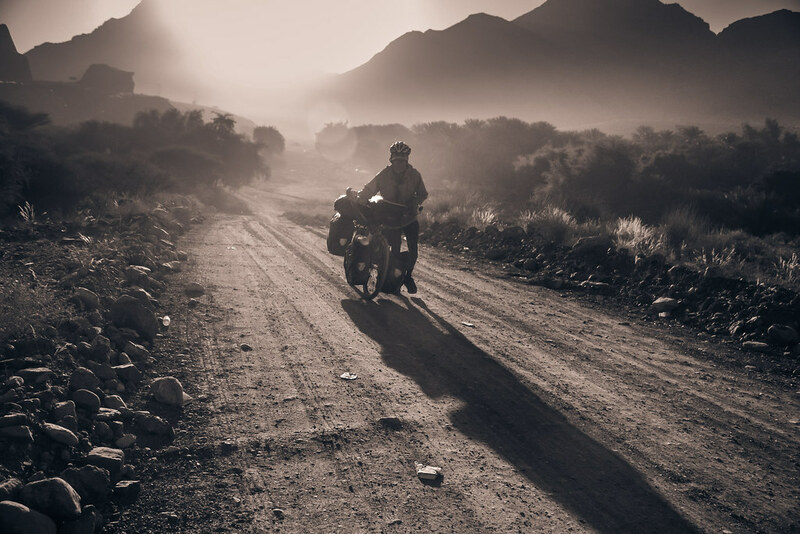 Setting off at sunrise in Oman’s Hajar mountains. What about drivers in Oman? Do they practice good road safety? Sadly, Oman ranks among the world’s deadliest countries for road fatalities. Omanis are not particularly conscientious drivers and have a fast and furious driving style. We felt safe enough on Oman’s roads, but maybe that’s because we’d just come from India. 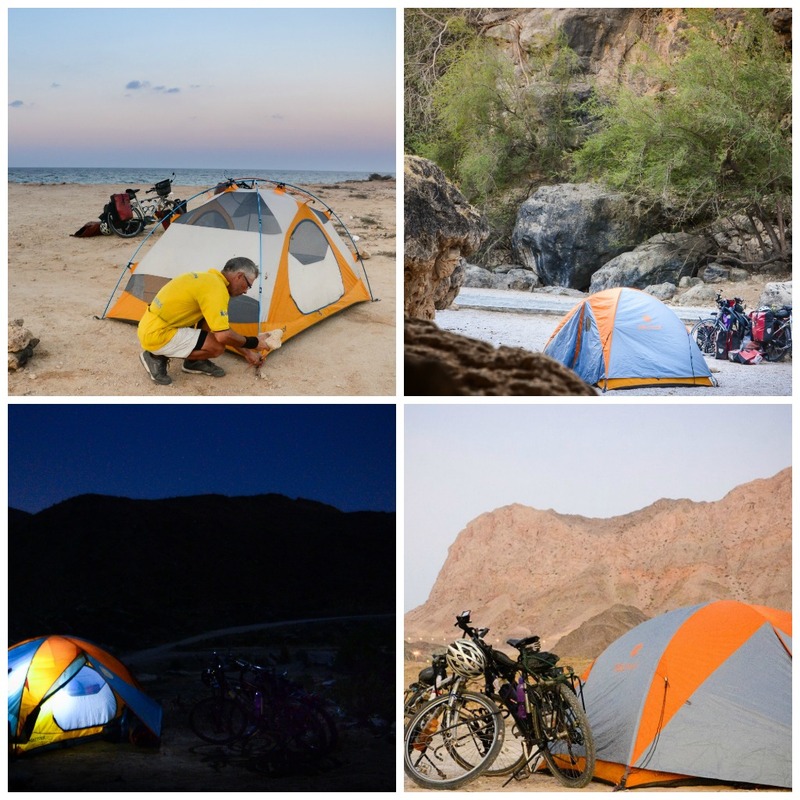 Where’ the best camping in Oman? Omanis and expats living in Oman love to camp, so pitching your tent will be quite an ordinary thing. Beach camping is popular and you’ll find shelters to provide protection from the sun. Wind can be brutal, so look for a protected spot. Camping in wadis (dry river beds) is another option. Flash floods can strike without warning so exercise caution. In Oman’s mountainous interior finding a flat spot to pitch your tent can take some time, but you’ll be rewarded with spectacular views and a star-filled sky. You might also enquire about camping at date-palm plantations. Workers will usually find you a spot to pitch your tent and you’ll probably also have access to a hot shower and electricity to charge your various devices. 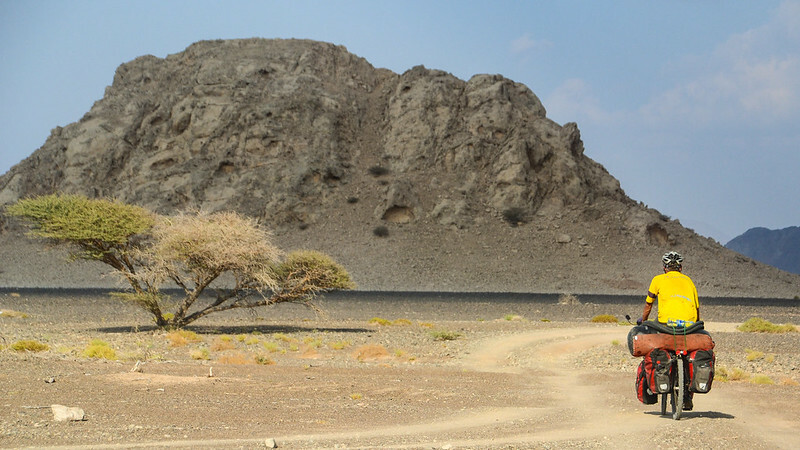 Our absolute favorite route is the Nizwa – Wadi Bani Awf – Rustaq ride. Stunning views make up for extremely rough roads and shockingly steep grades. 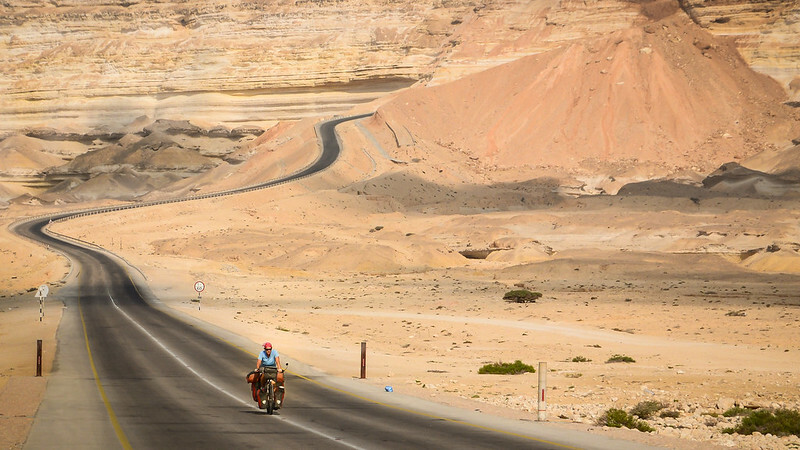 Another not-to-be-missed road is the ride up to Jebel Shams. You’ll encounter steep grades, but the road’s mostly paved and considerably easier than the Nizwa – Wadi Bani Awf – Rustaq route. The ride from Muscat to Salalah has some great coastal riding mixed in with some bleak and boring bits. You’ll see loads of camels and some fantastic sunsets plus get a real taste of rural life in fishing villages. The so-called ‘Black Mountain’…some of the toughest cycling we’ve done. Turn right on the short-cut halfway down the Jebel Shams road and propel yourself over the rough mountain road. Just a normal everyday occurrence in Oman. 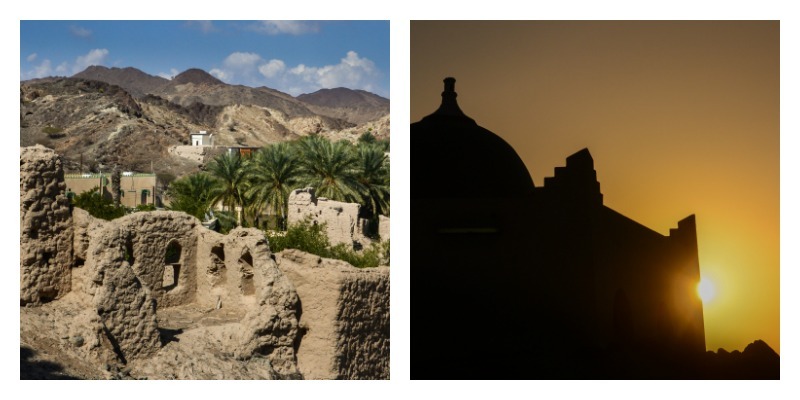 Nizwa – Wadi Bani Awf – Rustaq is just madness, but extremely beautiful madness. We started climbing from Rustaq side and a full day was spent pushing the bikes up, probably it’s better climb from other side with tarmac road. 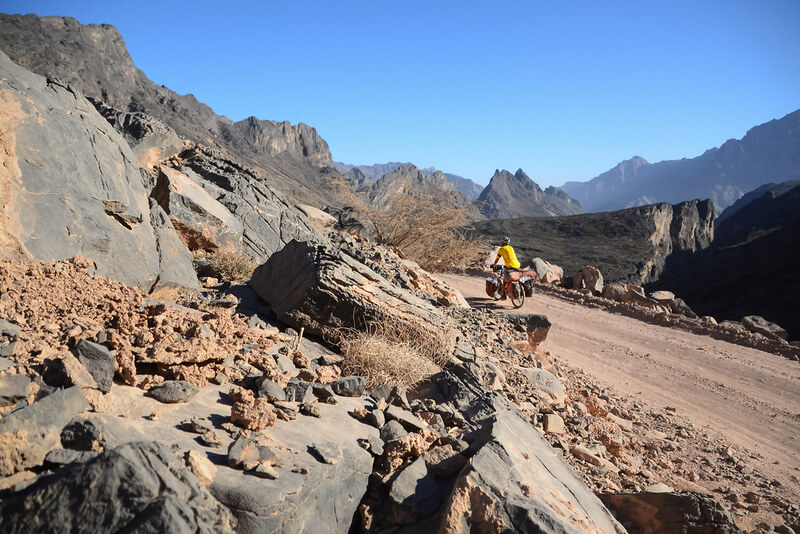 Madness…that is indeed a good description of bicycle touring Oman’s steep backroads. 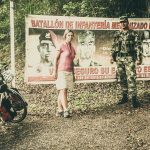 thanks for the write up – i am thinking of going in dec, looks great – thanks again for the info !! We just completed a 7 day coastal ride from Muscat to Salalah. An amazing 1,400 km journey in a beautiful environment. Check our instagram for some of the impressions #muscatsalalahrainbowride (but photo’s can’t capture the true beauty of Oman you see along the way)..
Beautiful place to ride your bike! 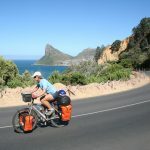 Thanks for sharing this helpful information about Oman bicycle touring routes. Thanks for this useful article Amaya. We’re planning to go this winter. Can I please ask how long you spent there? 2 months seems good to us ….any thoughts? Also, did you have a paper map? The ones I’ve seen for sale on-line don’t look or sound (from reviews) very good.